If you want to try out the Creative Cloud for free on your computer, that’s easy as there is a free level of membership available for instant download on both Windows and Mac OS. And any product trials downloaded in this manner can also be purchased the traditional way if you decide to go with regular licensing instead. (3) Enter your email for our free exclusive Adobe Special Offers Newsletter in the sidebar to the lower right (with important news and coupon codes, never spam, and unsubscribe at any time)… Current subscribers can just re-enter their address. (4) Leave an original comment below sharing your thoughts or questions about the Adobe Creative Cloud. That’s it! Each of these actions counts as a single entry into the drawing – so if you do all four, you would receive 4 different chances to win the Creative Cloud. Be sure your email is correct so that we can contact you. One entry per reader for each method, but please do share and tell your friends and colleagues who would like the software as well. Submissions are open until 11:59pm EDT on Friday, August 31st Tuesday, September 4th, 2012. The winner will be drawn at random from all valid entries, and contacted via email – and we’ll announce the lucky recipient (first name only) right here the following week. If you’re the one, we’ll send you the yearly Creative Cloud CS6 membership, for free! Contest is open to residents of all countries worldwide with up to four entries per person as outlined above. The sweepstakes winner will be determined at random from all valid entries. The participant whose name is drawn must respond to email notification within 72 hours after sending. By entering, all entrants agree to release ProDesignTools.com (the Sponsor), and its employees from all liability and claims relating to participation in the contest. Sponsor is not responsible for any late, lost, or misdirected commu­nications due to spam, technological, network, or email filtering issues. No substitu­tions or transfer of prizes or cash redemptions permitted by winner. Sponsor reserves the right, in its sole discre­tion, to cancel, suspend or alter the rules and parameters of the sweepstakes. Sponsor also reserves the right to substitute a prize or prizes as Sponsor deems suitable in the event that prize becomes unavailable for any reason. 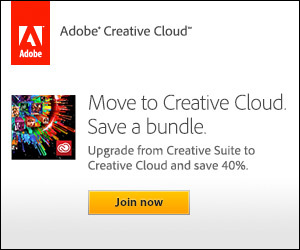 I’ve signed up for the Creative Cloud, but I’m still getting “continue trial” pop up windows? Only when I’m using Audition and Acrobat XI? What’s going on? Yes, that can happen sometimes even with paying members – but fortunately, there are usually easy solutions to fix it. Love the creative cloud and all the new software, I am having a ball with training videos and new applications! I am DYING to use Adobe Muse. I have been watching tutorials and learning how to use it before trying and then investing in it. Would love the chance to try out this cloud thingy! Love the prospect of staying up to date on software! Love the creative cloud. It gives me the software that I use everyday and gives me a chance to explore other software for the same cost. Hi. I Have been a science teacher for two years full time now. I use my iPad for everything. I have grown up with Photoshop in a PC-based environment up until now. I work for more than one school on a part time basis. I create marketing videos, build curriculum and also teach children. I am training staff at one school to use iOS. I will also be In Charge of introducing fellow teachers to the Adobe line of products for the iPad. I love sharing knowledge, methods, and tips with my community. I come from a science education background and I also take art seriously. This, plus Apple’s iOS which allows me to feel safe about the programs I distribute, recommend, or show to my children, has led me to the iPad before the schools I work for. I would like to have an Adobe membership in order to learn to use the products so I can help others in the field of education access the full potential of the Adobe line of apps for iOS. Thanks for the features you have allowed me to access already. I am looking forward to trying more.